Syrian refugees wait for buses to take them back to the border to cross back into Syria from their current location in Zaatari camp, in Jordan, September 15, 2013. Roughly 120,000 Syrian refugees live in the Zaatari camp. which has gradually become the fourth biggest city in Jordan, and every day dozens of Syrian refugees, disillusioned with their lives as refugees, are choosing to return back to Syria amidst the raging civil war. There are over 100,000 Syrian refugees living in Zaatari camp, roughly 600,000 refugees in Jordan. 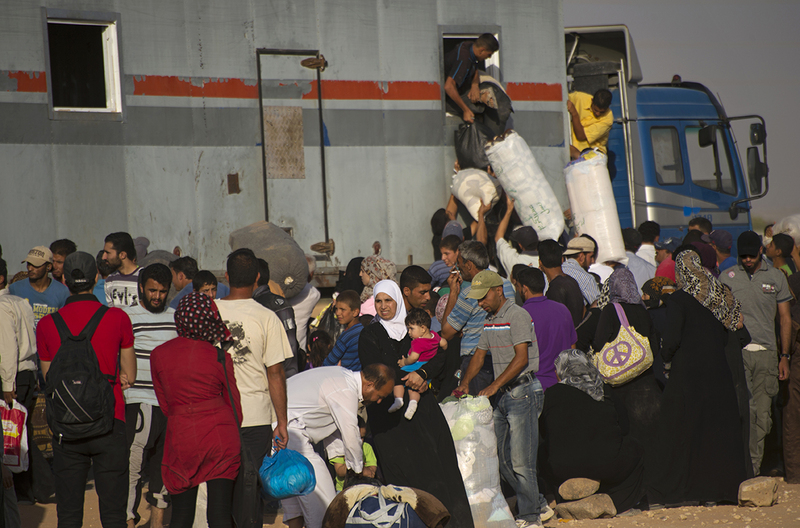 As the Syrian civil war rages in its third year, displacing over two million Syrians into neighboring countries, host countries are grappling with how to deal with ever-increasing numbers of Syrians. While governments generally prefer camps for easier management of the refugee community, many NGOs prefer urban refugees, because it enables Syrians better integration in society, and more freedom of movement. In Lebanon, the government has refused to set up typical refugee camps, so Syrian refugees have set up de facto makeshift refugee camps around the country: with people living under bridges, in abandoned schools and factories, in rented apartments with other families.